In a Baron-Rose Duo first, we played with a deputy! 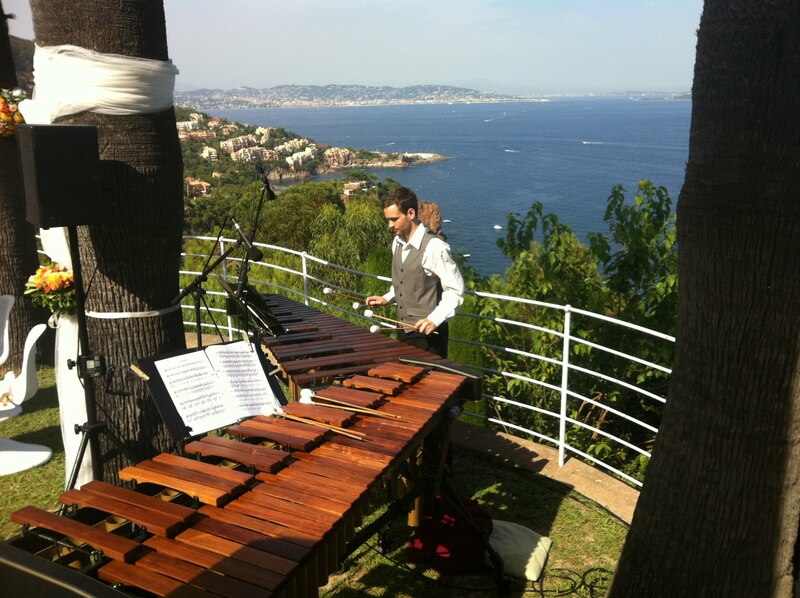 Due to Michael's unavailability, Nick teamed up with top UK jazz mallet player Anthony Kerr for a jazz-themed version of the marimba duo; a pre-wedding cocktail event on a rooftop bar in Oxford. We caught the last rays of summer, playing outside in the garden of Upton Barn, Cullompton for the wedding ceremony and reception of Toto-fans Siobhan and Darren! Our first wedding booking from outside the UK took us to the stunning Palais Bulles, on the French Riviera, for the wedding ceremony of Anne-Sophie and Martin. An amazing venue and a fantastic view from our playing position! After a summer season sabbatical, in which Nick travelled to Rio De Janeiro to study Brazilian percussion, work has begun on new material for the 2017 concerts and weddings. Watch this space! A beautiful setting for our latest concert; Wyndcliffe Court, near Chepstow, and a beautiful performance from our guest soloist Jennifer Walker (soprano). The audience warmly received our premieres of Faure songs. Our next event will be an evening of unique music at Wyndcliffe Court, with a concert following an early evening viewing of the Spring Sculpture Exhibition. Our special guest from the January concert, soprano Jennifer Walker, will once again be joining us for an extended exploration of the pioneering marimba-plus-singer combination. Many thanks to the Classics Conclave for having us play at their African-themed dinner event in Rhodes House, Oxford. While we played drinks reception music, some guests also enjoyed looking at two lions in an enclosure in the garden...certainly a first for us! Our first public concert in a year, as we returned to Newport Cathedral. Thanks to star soprano Jennifer Walker, who joined us for three items. The combination of marimba and soprano is virtually untested, but sounded really exciting and beautiful today. We also presented a section about the history of the marimba, including transcriptions from West Africa and folk songs from Guatemala among other things! Our second wedding of the summer took us down to Chiswick House for the marriage of Nick and Steph - congratulations! The highlight for us was having Antoine - a singer friend of the couple - join us to perform Bizet's aria 'Je Crois Entendre Encore' which was almost certainly another world first in this instrumentation. We have just returned home from our first wedding of the summer, and our first in the beautiful Llangoed Hall near Brecon. Thanks to Alexandra and Andrew who tied the knot today; we loved your musical requests and hope you enjoyed our new arrangement of 'Skyfall'. After a quiet winter, work begins on arranging new material for the summer weddings. Challenges include making 'Skyfall' into a marimba arrangement - the effect of the song is so dependent on the lyrics! Other new material for 2014 comes from a wide range of artists, including Bizet, Lily Allen and the Zombies. Thanks to everybody who we met at the Wedding Show Wales yesterday. It was great to hear your feedback and a pleasure to play your requests. After a summer of touring on other musical projects, the Duo have just been booked into the Wedding Show Wales at City Hall in Cardiff on September 15th; "the biggest wedding show in all of Wales, Bristol and the South West of England". In addition, we have just updated our YouTube channel and SoundCloud stream, so visit now if you haven't before! Today we played at the wedding of Saranne and Geoff, in the excellent venue De Courceys Manor House, Pentyrch. Congratulations to those two, and thank you for choosing us. Saranne told us afterwards that the sound of the marimbas playing pre-ceremony kept her calm before she entered the room to walk down the aisle. Footage of our last concert is now up on YouTube. The playlist features Bach's Goldberg Aria, Kiss From A Rose, Salut D'Amour, The Beatles' Something, Pachelbel's Canon, The Swan, All You Need Is Love and more. Watch it on our YouTube channel here. Congratulations to Jenna & Dan, who tied the knot in Cardiff today. Our appearance was a well-kept secret from the bride, who had seen us play at a wedding fayre but didn't know that her mother then booked us for the wedding day! We have just finished editing two more home recordings - All You Need Is Love and The Marriage Of Figaro Overture. Enjoy. Wonderful concert today in Newport Cathedral. Thanks again to Sophie Nash for your fantastic cello playing. Catherine couldn't make it as she had been struck down with a fever all week, but the Duo plus cello provided a great programme regardless, warmly received by our audience. Footage coming soon. We had a fantastic rehearsal today with our cellist friend Sophie, ahead of next week's concert in Newport Cathedral. The Facebook event page is here. Today we did some more home recordings on the Roland mp3 recorder; the material from the weekend ('True Romance' and 'Kiss From A Rose'), as well as the accompaniment parts for our vocalist to rehearse with. Soprano Catherine Jones will be performing Debussy 'Beau Soir' and Bach 'Bist Du Bei Mir' in the upcoming concert; this particular combination has never been explored before so it's an exciting time for us. Congratulations to Adriana & Liam, who tied the knot in Southampton today. It was a pleasure to play you down the aisle with 'True Romance' and play you out with 'The Marriage of Figaro Overture'. Thank you as well for requesting some new material from us - 'Somewhere' from 'West Side Story' seemed to go down well as you were signing the register. Great tune - studying the harmony for the arrangement made me realise what a great songwriter Bernstein was. A day out at the Newport Hilton wedding fayre. It was a wonderful space to play in, very resonant and boosted our sound nicely. Our Bach numbers were a particular joy to play. Thanks to everybody who stopped to chat and show interest in our music. We ran out of flyers which is a good sign that we were well received. The date is confirmed for a concert next year in Newport Cathedral; on February 23rd we will play a lunchtime concert in aid of the Cathedral's Emergency Repair Appeal. It's a wonderful historic building and a beautiful acoustic for marimba. We have already planned some guest stars with innovative repertoire; Sophie Nash on cello will play Elgar's 'Salut D'Amour' with the marimba duo accompanying, and Catherine Jones is in line to sing three numbers; Debussy's lovely rich song 'Beau Soir', Bach's elegant 'Bist Du Bei Mir' and a cover of Irish New Age singer Enya's 'On Your Shore'.